This watch has a bezel that is a great adaptation of the standard and used slide-rule which is a mathematical apparatus that is used throughout the years by engineers and scientists to design everything, including producing rockets and sending astronauts to space. This wristwatch features a flight computer. Although this watch is not the first one to use this concept, Seiko is the company that was able to execute it well on this wristwatch. The slide-rule is a feature that can perform a great number of mathematical operations, from the basic math problems to unit conversions but it will take you some time and some practice to be able to operate it. Although the slide-rule is not as popular as it used to be because of the digital calculator, the appeal of this feature is difficult to deny. Combined with the alarm, 200M of water resistance and chronograph, the Seiko Flightmaster SNA411 is a very attractive sports wristwatch for those who love the flight chronograph feature. Seiko is a watch company that originated in Tokyo, Japan. This Japanese product started in 1881. It became a corporation about a century ago in the year 1917. Seiko started as a watch and jewelry shop then they produced clocks and wristwatches in 1892. The company’s name Seiko means “exquisite” or “success” in Japanese. In the year 1969, Seiko released the first quartz, the Astron, and it is the first one in the world. Today, the Japanese company Seiko is best known for their amazing and elegant wristwatches. The Seiko SN411 is a wristwatch that measures up to 42mm and it’s actually smaller than what its specs would suggest on its details. The slide rule and the bezel use most of the visual space, so it leaves only around 32mm for the face of the watch. It is combined with the short lug with a distance of 44mm, the wristwatch is more like a 40mm watch than the advertised 42mm wristwatch. The case design of this wristwatch is very basic, yet it is robust. It has a simple cylindrical barrel that is polished, and it has short legs that are straight, and it has a radially brushed and styled case-back encircle that has a black chronograph dial. Around the right side of the case, you will see the chronograph pushers and the crown. It features a unique design that is screw-down, and it allows the buttons to be close together and locked in either a closed position or an open position. The bezel of this wristwatch has a grippy type sawtooth edge and it has a smooth bi-directional motion or action, so it makes the adjustments and the calculations as easy as a snap. The dial on this wristwatch is intense. The combination of reflective and raised surfaces, a moving cluster of the watch’s sub-dials and the slightly-domed crystal make the dial great and interesting to look at. The wristwatch is also shinier and more sparkly than its pictures would suggest, making it the best choice for formal and for business wear. The yellow markings ties with the bright yellow chronograph of the watch, giving it a sporty yet elegant touch that supports its water resistance of about 200M. Its internal bezel is a bit sloped, so it enhances the overall readability and it lends a bit more interest in its vision. This watch has a steel bracelet included which makes it lean towards the dressy and classy side of the overall spectrum. It has polished center links that match the case and it sets off some of the reflective elements on the dial. If you are looking for a watch that can do more than just tell the time, then the Seiko Flightmaster SNA411 is the watch for you. It is the perfect watch for pilots and engineers, it can also be worn by those who want a watch that is loaded with features and a watch that looks great in whatever style you wear, may it be sporty or classy. It is a budget-friendly watch that will not require you to spend more than you plan to. The Seiko Flightmaster SNA411 is a part of the flight chronograph collection of Seiko. It has a solid brushed and polished steel case that is stainless, as well as its bracelet. It is 42mm in diameter and is 13mm thick. It has three sub dials for the alarm, its second hand, and its 60-minute hand. It has a black dial with silver-toned hands that are luminous, as well as its hour markers. It also has a Japanese chronograph quartz movement that is precisely tunes, a date display feature, a bezel that rotates and which can be used as a slide-rule and a crown that is screwed-down and buttons that are locked by a screw. It has an alarm that is of 12-hour basis and a Hardlex crystal that is finely crafter and scratch resistant. The chronograph has a measurement of around 60 minutes and it can run up to 12 hours in a matter of 1/5 seconds. It has a deployment type clasp that has a push-button and it can work in up to 200m of water since it is water resistant. Seiko Flightmaster has a dial that is very busy as it is the face of a flight/aviation watch. The outer edge of the watch’s black dial has scales of rotary slide rule that can be used for different purposes, such as calculations that are important for an engineer or a pilot. This watch has a chronographer, there are three sub-dials that takes most of the space around the center. The top sub-dial of the watch is for the minute while the one on the left is for the seconds. The second hand, which has the color yellow, will only move when you use the chronograph. The sub-dial at the bottom is for the alarm and it can also be used for setting a different time zone which is useful when you are traveling. It has a black bezel and it has scales for the rotary slide rule. It can be rotated anti-clockwise and clockwise and it is thick enough to make your watch appear smaller than it actually is. The hands of the watch have lume applied on top of them. It has small markers and small dots on the watch’s dial which are also found on the lume. The wristwatch comes with a 42mm stainless steel case and it is 13mm thick. The lug width is 20mm and is fitted with a steel bracelet that is also stainless. This is solid and sturdy which is typical for Seiko watches. It is made with Hardlex crystal and it has a slight dome to it. This wristwatch is water resistant and it can be used in up to 200M of water. This watch can be worn while you swim or when you go scuba diving. It is also scratch free and shockproof. 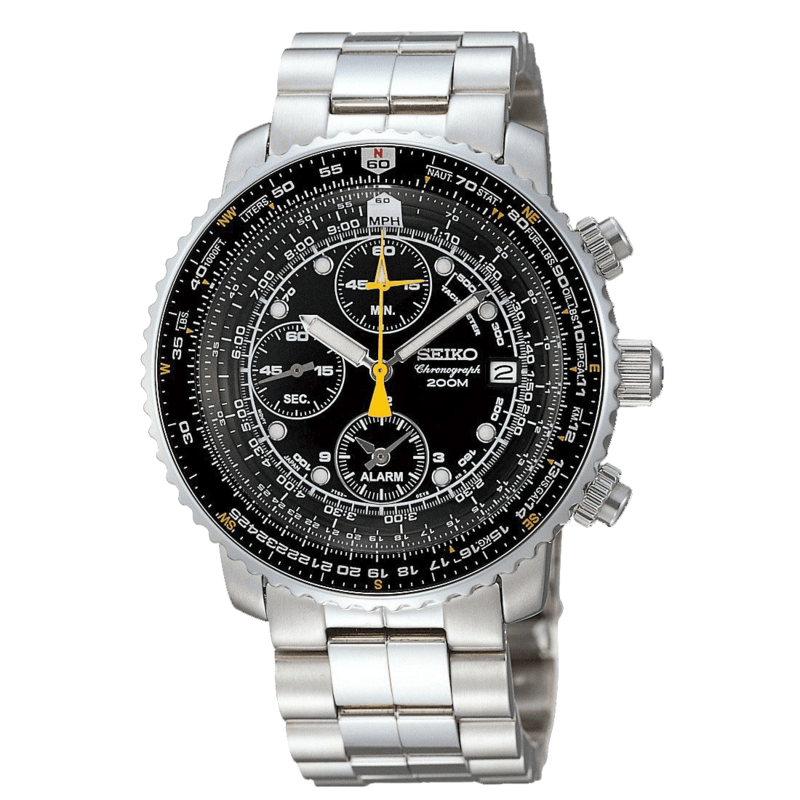 It has a chronograph that is a functional tool and is useful for engineers and pilots. To use the feature, you need to operate the two pushers found on the right side of the watch. The one at the top right is used to start and to pause the chronograph while the one at the bottom right is used to reset the chronograph. It also has a split time function, which is useful for sporting events. You can record time of events. The slide rule is used in mathematics, engineering, and science to make fast calculations. It is used for division, multiplication, exponentials, logarithms, square roots and trigonometric functions. This means that with this feature, you can calculate speed, distance, convert units, weight, volume and more. Customers who have purchased and used this wristwatch has given so many positive reviews about it. It is a professional tool that has many benefits, its water resistant so it can still be worn even during your water activities and it can help you calculate and convert without having to look for a calculator nor having to check your phone. It also suits every style, from business to casual and from formal to sporty. It is also scratch resistant and shockproof, so it does not shatter nor break easily even if you accidentally drop it. There are some customers who have stated that their watch stopped working after a couple of months. During cases like this, you need to contact their customer service by checking their website or you can also have the batteries checked or replaced with something that lasts longer. This wristwatch runs on battery, so it requires replacement and it requires maintenance every now and then. With proper care, it can last for years. How water resistant is the watch? This watch can withstand up to 200M of water, so you can use it when you are showering, swimming, scuba diving and while you do other water-related activities. What is the strap made of? The strap of the Seiko Flightmaster is made of stainless steel. It is also scratch resistant. Can it be used as an alarm? Yes, the watch can be used as an alarm and it can be set using the 12-hour format. Is there a customer service hotline that I can call if I have any concerns? You can check on Seiko’s website. You can send them an email or you can give them a call if you have any concerns or questions regarding their product. 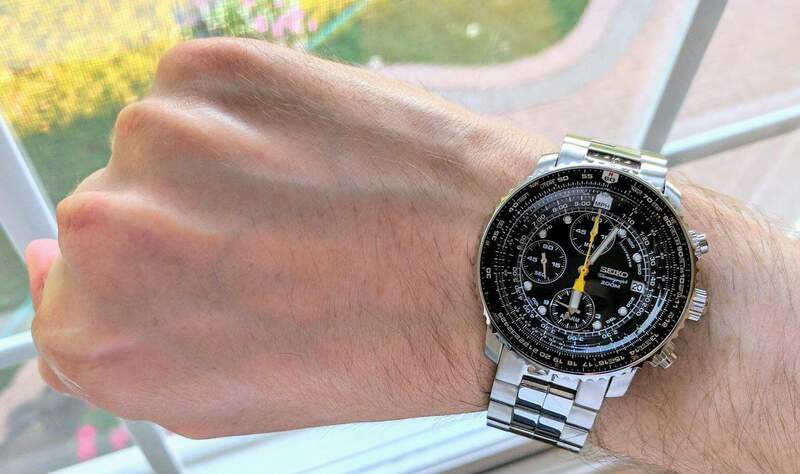 Where can I purchase the Seiko Flightmaster? This wristwatch can be bought in watch stores, in Seiko stalls or shops and it can be bought online. The Seiko Flightmaster SNA411 is an aviation watch that has complete features. It also has a reasonable price and it is considered one of the most budget-friendly aviation watches in the market. It is very easy to use, and the dial is superb in all of its features, it is known as one of the real utility watches. It can also be very helpful for pilots and engineers. 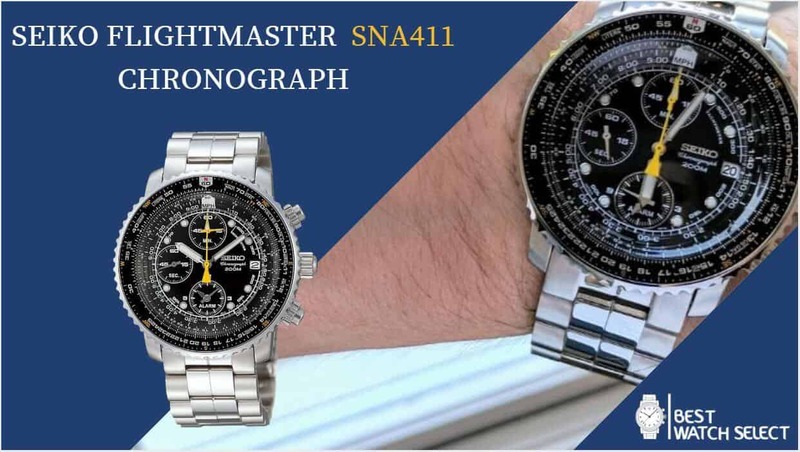 It has the rotary slide rule, the compass ring, the conversion scales, the tachymeter scale, and the chronograph, these make the watch the only tool that you will need for your outdoor adventure, your travels or your maiden flight. It is also water resistant and it can outstand around 200M of water, this wristwatch can even be useful during scuba diving and it looks amazing on any style. It can be used for casual events or business meetings. It can even be paired with sports attire. This watch can be used anywhere, and it can also be seen in the dark because of its luminous hands. The Seiko Flightmaster is truly one of the amazing watches in the market.